Fossil has this cool Negative/Positive Display - Black Croco style watch for a low price of $130.00 with no tax and free shipping. Designed by postmodern architect Frank Gehry and developed by Fossil this Gehry Writes Time Digital watch has an innovative time read out display in Frank Gehry's own script. 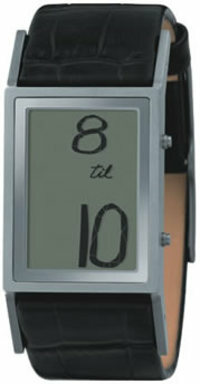 If the time is 11:30, the display reads in script, "half past 11" and if the time is 12:54, it reads as "6 til 1". The display also automatically switches back and forth showing a negative screen during daylight hours and a positive screen at nighttime. Also contains a calendar function. Features a brushed titanium case with a silver colored titanium plate around the perimeter of the display and a black croco leather strap. 11-year warranty. This is one of the most interesting designs of a wacth I've ever seen.It's great and so modern.Watches are so beautiful accessory that everyone should have.